1. Private, worker, community or cooperative ownership. 2. At least 50% locally-owned. This means the owners live in the geographic area where the business is located. 3. Decision-making authority is vested in the local owners and not subject to conditions dictated remotely. 4. The business has a limited number of outlets and limited geographic area. Within 100 miles of our store and within the state of Tennessee. Designated by these green tags. 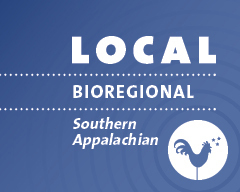 Within the Southern Appalachian Bioregion. A bioregion is a land and water territory whose limits are defined by the geographical limits of human communities and ecological systems. Designated by these blue tags. 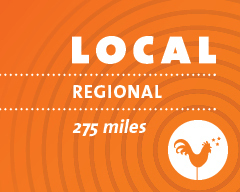 Within 275 miles of Three Rivers Market and/or within the Great State of Tennessee. Designated by these orange tags.